Are you thinking about adopting a service dog? What is a "retired" service dog in the first place? When deciding to add a new adult dog to your family, have you considered adopting one that is actually "retired"? To help these animals find new permanent homes, there are guide dog organizations who provide adoption programs as part of their services when adopting a service dog. 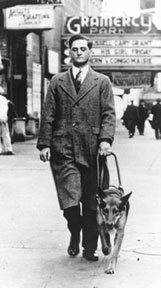 Any dog that was trained for or actually worked a "career" by leading the blind or by helping other disabled people is a prime example of a working dog. If you look up the reports provided by the International Association of Assistance Dog Partners, you'll find that there are over 8,000 dogs in the United States alone that are currently "employed" - providing services by helping the deaf, guiding blind people and offering assistance to other disabled men and women. It takes a truly special and intelligent dog just to get excepted into any program which will train them for a career as a service dog in the first place. They must be well adjusted, well socialized and in good health. Just these attributes alone, before being trained to work, would make a truly incredible pet. Now imagine anywhere from six months up to two years of additional heavy-duty obedience training and career protocol programs. The result is a dog that anybody would be extremely grateful to have as a house pet. So, when you decide to go to a adopt a service dog, or any dog, especially if you are thinking of adopting a service dog, add this option to the shelter or any of the usual places to buy or adopt a dog. Facilities that specialize in providing dogs that are ex-service oriented, or those canines that for some reason or another did not completely make it through the training can be found throughout the US. There are at least 3 basic choices of service dog types to choose from if you have ever considered adopting a service dog: dogs that are retired from being guides, "career changing" dogs, and finally, there are the dogs that did not make it through the training program for some reason or other. 1) Guide Dogs No More: Service dogs cannot work their jobs forever. As these dogs get older, they become slower and are no longer effective in helping their owners. On average, a service dog can work approximately 8 years. At this point they become prime candidates for adoption. 2) Dogs That Have Had Multiple Careers: Many dogs can be taken right out of one service job and then trained for another one. For example, a dog may be retired from guide service and then prepared and transferred to work at a rehabilitation hospital or a nursery home. 3) Just Didn't Make The Cut: Finally, we have our drop outs. Thousands of dogs are trained every year by organizations which lead them into service jobs. Not all of these dogs make the final cut for whatever reason. However, the important thing to remember here is that these dogs are still a cut above any other dog you may find elsewhere. Most are highly trained and well socialized. All these dogs are definitely in high demand. For the dog just to get accepted into these types of programs for training preparation means they already had natural first-class qualities and characteristics in the first place and for them to have a career says loads about the dog. All these animals would make wonderful companion pets for any family. Adopting a service dog offers you many more options to your future foster pet choices. Good luck.